English courses with Twin: Snow in London. Yesterday it snowed in London. 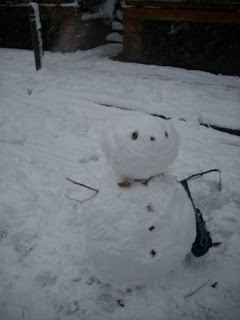 We made a big snowman with our home stay mom. In the afternoon we slept at home and did our homework. Yesterday we had a delicious supper. It was snowing yesterday in London. There were no buses, so we couldn’t go to school. We stayed with our host family. While it was snowing we played outside for a long time. There were no buses yesterday. It was terrible. I spent the whole day with my host family. I made a snowman with my roommates.